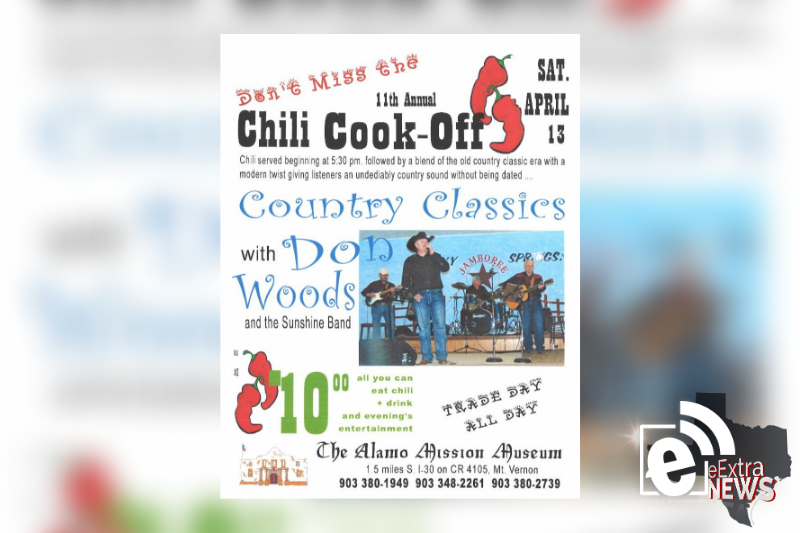 The Alamo Mission Museum is expected to host the 11th annual Chili Cook-off on Saturday, April 13. Chili will be served at 5:30 p.m., followed by a blend of music — old country classic era with a modern twist — with Don Woods and the Sunshine Band. The all-you-can-eat chili, drinks and evening’s entertainment is $10 per person at The Alamo Mission Museum, 1714 County Rd SE 4105. For more information, contact 903-380-1949, 903-328-2261 or 903-380-2739.